This is the last entry for 2009. Please see our new Latest News page. Members of the team gathered in the tower at 11.30pm on 31st December to ring out the old year and ring in the new. The bells were raised and we rang touches of Plain Bob Minor on the front 6 bells and rounds and call changes on 8 up to 11.55pm. At 11.57pm the bells were silent. We had the radio on in the tower so that we could synchronise our striking of the 12 strokes on our Tenor bell with the striking of Big Ben. 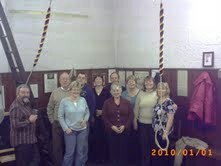 The new year was welcomed with ringing on 8 bells through to 12.10am followed by ringing down. New Year greetings were exchanged, party poppers fired off and we left the tower having revived the tradition of ringing in the New Year for the second year in succession. To raise funds for the Peal Appeal we have 2 concerts taking place in the Church. Ecclesfield Handbell Ringers and Grenoside Singers are performing on 20th March and the Sheffield Folk Chorale will be performing for us on 24th April. Both concerts start at 7.30pm. More information and how to book tickets on our Events to Raise Funds page. The bell ringers at Ecclesfield would like to wish everyone a Happy Christmas. The bells were ringing last night prior to the Christmas Eve Service of Carols and Readings and again this morning for the Christmas Morning Service. 21/12/09 - Ringing for You, Say it With Bells. We have launched our Say It With Bells initiative as part of our fundraising for the Peal Appeal. If you have a special occasion and you want to make it even more special why not have the bells of St Mary’s rung for 45 minutes by our team just for you. It could be for an anniversary, birthday, engagement, christening, or just as an unusual gift for someone special. Bells are often used to celebrate events, let them celebrate yours. For more information Go to our Say It With Bells page. The World Council of Churches organised a call to action initiative on climate change to get Church bells rung throughout the world at 3.00pm on 13th December coinciding with the Ecumenical service in Copenhagen Cathedral. At 3.00pm, our bells were rung to a Quarter Peal of 1260 changes of Plain Bob Doubles in 46 minutes. More information about the Quarter Peal. 5 of us joined in with around 20 ringers from Sheffield Branch of the YACR and ringing students from the Sheffield Universities' Guild of Change Ringers to ring the bells of the Cathedral Church of St Marie in the city centre. 'Look Local' newspaper published an article about our Peal Appeal along with a photograph of Angela Smith MP, taken when she visited the Church and watched us ringing the bells for Sunday Service. We were delighted to welcome Angela to the tower and that she was supporting our appeal. Details on the Look Local website. We held a very successful coffee morning on 14th. The tower was open for visitors, we had a ringing simulator in the Church which people could have a go on, and cakes and bric-a-brac were on sale. We would particularly like to thank those of you that gave us a donation towards the Peal Appeal. Thank you to all that attended the event and if you are interested in having a go at ringing, please come and see us on Tuesday evenings at 19.30 in the tower. 6 of our ringers met up with ringers from the Sheffield Branch of the YACR to ring on the 18cwt 8 at Harthill. We rang the bells from 10.30am to 12 noon then went across the road for a pub meal in the Beehive. We rang a Quarter Peal prior to the Evening Service. 1280 changes of Plain Bob Major in 47 minutes. 7 of our ringers and one of our ringing friends from St Mary's Beighton rang the bells from 5.35pm. More information about the Quarter Peal. We had some fundraising stalls at the Autumn Faye in the Gatty Hall and the tower was open for visitors. If you were one of our visitors and you are interested in taking up bell ringing, please come again on a Tuesday evening 7.30pm. The Sheffield Star newspaper published an article about our Peal Appeal along with a photograph of Sheffield's Lord Mayor, taken when he visited the Church and watched us ringing the bells for Sunday Service. We were delighted to welcome the Lord Mayor to the tower and that he was able to help us launch our appeal. Our ringers joined by family, friends and ringers from St Mary's Beighton had a day out ringing in churches in East Yorkshire. We started the day on the 6 at St Michael's, Eastrington. This Church has a window that depicts ringers in a tower. Next was North Cave where we had a short coffee break beside the picturesque lake before ringing on the 6 at the Church of All Saints'. Following our lunch break we rang on the 8 at All Saints', Market Weighton. By 4.00pm we were at All Saints', Holme on Spalding Moor ringing on the 6 bells. This is the Church on the hill that so many of us had passed many times on the way to the east coast. The local ringers here had prepared tea, coffee and cakes for us which we enjoyed and we would like to thank them for this welcome refreshment break. Final ringing of the day was on the heavy 8 at St Peter & St Paul, Howden Minster. The climb to the ringing chamber involves 2 spiral staircases and a walk across the roof. Our group thoroughly enjoyed the day and the fish and chips in Howden following the ringing. At the morning services on 11 October we officially launched the 'Peal Appeal'. An information board is on display in the Church providing details, explanations and leaflets. Prior to the evening service we rang a Quarter Peal to mark the launch of the Ecclesfield Peal Appeal to raise £60,000 to augment and tune the bells and to carry out essential maintenance. More information about the Quarter Peal. 6 of us joined ringers from other towers in the Sheffield and Rotherham area for a day of ringing in Manchester. We started our tour at St George's, Stockport followed by St Mary's, Eccles. After lunch we rang at Sacred Trinity Salford and finished the day by ringing at Manchester Cathedral. The day was organised by the Sheffield Branch of the Yorkshire Association of Change Ringers. We did not have a practice night at Ecclesfield on 8th September, instead 4 of our ringers rang in a Quarter Peal at St Mary's, Handsworth. 1260 Grandsire Triples in 43 minutes for the Patronal Festival of St Mary. Then 7 of us joined ringers from other towers at the 10 bell practice at Rotherham Minster from 7.30pm to 9.00pm, organised by the Sheffield Branch of the Yorkshire Association of Change Ringers. Prior to the evening service we rang a quarter peal which was one of the most challenging ones we have attempted so far. 1320 Doubles, 11 different extents in 44 minutes. 120 each of Stedman, Reverse Canterbury, Clifford's Pleasure, Southrepps, St Simon's, Eynsham, St Martin's, St Leonard's, Plain Bob, April Day, Grandsire. More information about the Quarter Peal. We have been meeting on a Friday evening for some weeks to perfect some of our ringing methods. We use our ringing simulator therefore you would not actually hear any bell sounds outside the tower. This evening we rang the first quarter peal on the simulator. In 43 minutes, 1260 Plain Bob Minor. More information about the Quarter Peal. We were pleased to welcome a visiting team of ringers from Chester and Wirral area on Wednesday afternoon. From 2.30pm to 3.30pm they rang a variety of methods on our bells. The bells were rung for the 10.30am service and again in the afternoon when we rang a Quarter Peal prior to the evening service. 1260 changes of Plain Bob Minor on the front 6 bells in 43 minutes. More information about the Quarter Peal. The Sunday Service band rang a Quarter Peal prior to the evening service. In 45 minutes 1320 changes of Plain Bob Minor. More information about the Quarter Peal. The Sheffield Branch of the Yorkshire Association of Change Ringers held their monthly meeting at Ecclesfield on Saturday. This was a joint meeting with Chesterfield District. 35 ringers assembled in the ringing chamber to ring the bells to methods ranging from rounds and plain hunting to 8 spliced Surprise Major. The Branch hold monthly meetings at towers throughout Sheffield and Rotherham and occasionally further afield. For 400 years bells have been ringing from the tower at Ecclesfield. This has been made possible by routine maintenance and major overhauls carried out at various times over the centuries. We now need to do some work again to renew bearings, pulleys and clappers but also the tower louvers on the belfry need repair or replacement. Increasing our 8 bells to a ring of 10 has been discussed for many years and we feel this is the time to do it. Following discussions and a survey by the bell foundry it is our aim to add 2 new treble bells and to have 2 of the original bells recast. This along with tuning of the entire ring should ensure that our bells are heard, improved and remain ringable for future generations. Full details are on our Ecclesfield Peal Appeal page. We are proud to announce that the tower has been fitted with a multi-bell ringing simulator. This is a very useful training aid and integrates computer software with change ringing. We believe that bell ringing as an art should continue in the traditional way. At the same time we are aware that as technology advances there is a place for it in bell ringing and we should make use of it to support the centuries old practice of ringing changes so that it becomes more accessible and viable for the future. More information about our Ringing Simulator. We attended the St Mary's Beighton ringers' barbeque on Saturday evening. 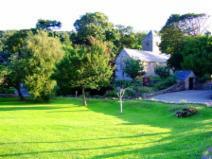 In the grounds of the Church we enjoyed traditional barbeque food in the warm evening sunshine. Beighton are raising funds to have clock chimes fitted to their bells. 2 of our ringers taking a holiday in North Wales on the Lleyn Peninsular joined the local teams ringing at Llanbedrog (pictured 5 bells) and Porthmadog (8 bells). Also visiting were ringers from Devon. Afterwards our ringers and their new acquaintances adjourned to the local pub for a well earned Guinness or two. Thank you to the ringers at the 2 towers for their hospitality. Visiting towers whenever you are in another area is something that many ringers do. It is part of bell ringing and ensures that you will usually make new friends from all over the UK . 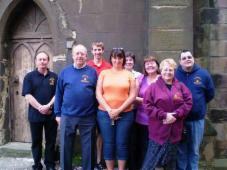 Held every year, this residential course for bell ringers runs from Friday evening to late Sunday afternoon and uses towers in the Sheffield area for the practical sessions. Each bell ringer is tutored in a method of their choice and then provided with tower-based practical sessions. On Friday evening 10th July Ecclesfield tower played host to some of the students on the course. A group, helpers and a team leader held a practical session concentrating on a bell ringing method. The bells were rung from 7.45pm to 9.00pm. We rang a Quarter Peal prior to the Evening Service in celebration of the Ruby Wedding Anniversary of The Vicar of St Mary's Ecclesfield, The Revd. Canon 'Tricia Impey and Revd. Richard Impey. More information about the Quarter Peal. The Yorkshire Association of Change Ringers, Sheffield Branch, hold a quarter peal weekend each year. The aim is to have quarter peals rung in as many Sheffield Branch towers as possible. This quarter will also be recorded as part of the Quarter Peal Weekend. 4 of our team joined members of the Doncaster and District Society of Change Ringers for an evening ringing on the 8 bells at St Mary's, Rawmarsh. Members of our team joined with other ringers from the Sheffield and Rotherham area for an evening meeting of the Sheffield and District Branch ringing on the 8 bells at St Mary's, Bolsterstone. Afterwards most of the ringers spent another hour in the Castle Inn. Sunday morning ringing commenced at 9.45 and continued while the congregations of St Mary's and Trinity Methodist Church walked through the village to hold a joint open air service in the churchyard. The bells fell silent at 10.27 to allow the service to begin on what was the warmest day this year. Before the evening service the we rang a Quarter Peal to celebrate Pentecost. In 44 minutes 1260 changes of Grandsire and Plain Bob Doubles were rung on the back 6 bells. More information about the Quarter Peal. 2 of our ringers holidaying in Norfolk joined the ringers of St Mary the Virgin Martham (6 bell tower) on their practice night. It was a very enjoyable evening and thanks go to the Martham ringers for their hospitality. We rang a Quarter Peal prior to the Sunday Evening Service and as a welcome to Dr Stephen Croft as Bishop of Sheffield. 1260 Stedman Doubles in 44 minutes rung on the front 6 bells. More information about the Quarter Peal. The Sheffield Branch of the Yorkshire Association of Change Ringers holds an annual ringing competition open to all towers in the area. Each team tries to ring an agreed number of changes with as few ringing faults as possible. Ecclesfield entered and were placed 3rd behind Walkley (2nd) and Sheffield Cathedral (1st). 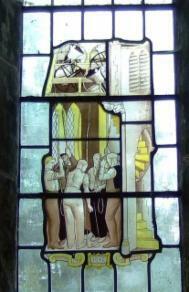 The event was held this year at the 6 bell tower at St Leonard's, Thrybergh. The photo shows the 6 members of the Ecclesfield team. If you click on the photo it will open in a new window. Our latest Quarter Peal involved 6 members of our team and 2 from St Mary's Handsworth. Prior to the Scouts St George's Day Service being held at St Mary's Handsworth we rang 1288 changes of Plain Bob Triples in 43 minutes. We finished just as the band outside started playing for the parade. Afterwards we had this photo taken of the team. If you click on the photo it will open in a new window. More information about the Quarter Peal. We rang a Quarter Peal prior to the Palm Sunday evening service and performance of Stainer's "Crucifixion". 1260 changes of Plain Bob Minor were rung in 48 minutes on the back six bells. More information about the Quarter Peal. 7 members of our team joined with other ringers from the Sheffield area for afternoon ringing on the 8 bells at SS Peter and Paul, Caistor. 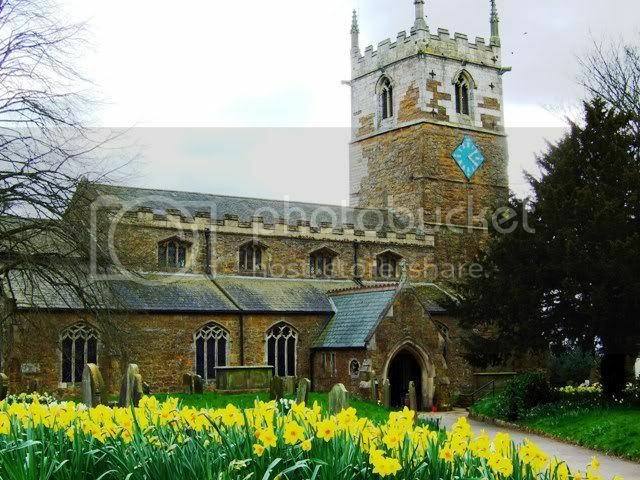 The weather was fine and sunny, the daffodils were in full bloom in the Churchyard and prior to ringing we had been taking in the air and the fish and chips at Cleethorpes. Afterwards we made our way to evening ringing on the 12 bells at Holy Trinity, Barrow Upon Humber. We rang the bells from 7.00pm to 7.30pm prior to the Renewal of Marriage Vows Service, led by The Right Revd. Cyril Ashton, Bishop of Doncaster. This was part of the weekend Wedding Festival. Members of our team attended the Sheffield Branch meeting of the Association and rang at the 6 bell tower of St Helen's Treeton in the afternoon. We then went to Whiston for a ringers service at St Mary Magdalene, followed by the AGM and evening ringing. 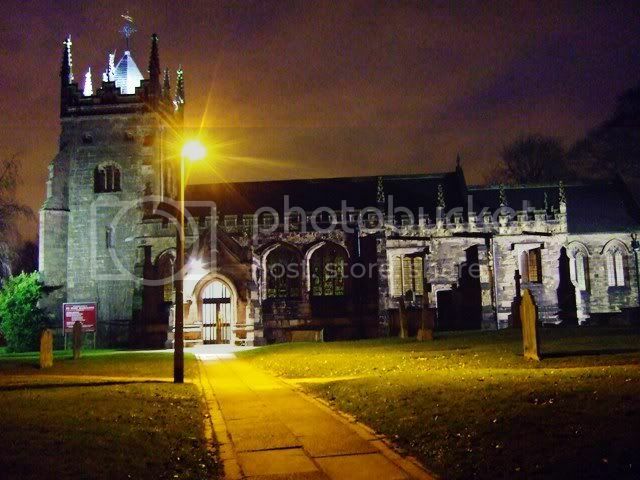 This photo shows Whiston Church floodlit. Click on the picture for a larger photo. The local band rang a Quarter Peal prior to the Evening Service on St David's Day, 1st March. In 45 minutes on the front 6 bells we rang 1260 changes of St Clement's Bob Minor. More information about the Quarter Peal. We held one of our Friday evening ringing visits to another tower on 27th February. This time we headed for Barnsley. 9 of our ringers met up at the 6 bell tower of St Paul's Church, Monk Bretton. We rang a variety of methods from 7.30pm to 9.00pm and we all enjoyed ringing the 10cwt six. Afterwards we adjourned across the road to the Norman Inn for a drink and a chat with some of the local team. We rang bells on Wednesday between 7.00pm and 7.30pm for the Ash Wednesday Evening Service. Prior to the Evening Service we rang a Quarter Peal of 1260 Plain Bob Doubles. On the front 6 bells in 44 minutes from 5.40 to 6.24. More information about the Quarter Peal. On the afternoon of 14th February, 5 people from our team joined ringers from other Sheffield Branch towers for an afternoon of ringing on the 8 bells at St James' South Anston. We enjoyed the ringing and the tea and biscuits served by the South Anston ringers. We welcomed a visiting team of ringers from the Reading area on Saturday morning 14th February. From 9.30am to 10.15am they rang a variety of methods on our bells. They left us to make their way to ring at Sheffield Cathedral followed by Rotherham Minster. Our team rang a Quarter Peal this evening in memory of David Christopher Munday on the day of his funeral. Chris was a good and helpful friend of ours and this tower. He helped us out many times when we have been short of ringers and often attended our practice nights. Chris's home tower was St Helen's, Treeton. More information about the Quarter Peal. The bells were raised and we rang touches of Grandsire and Plain Bob Doubles on the front 6 bells up to 11.50pm. The old year was finally rung out with a course of Plain Bob Minor on the back 6 bells. The New Year started with fireworks outside (not ours) and a touch of April Day Doubles on our back 6 bells. We continued ringing while about 12.15am when we stopped, lowered the bells, exchanged New Year greetings and left the tower having revived a tradition that has not been carried out for some years in the village. We would like to wish everyone a very happy New Year from the bellringers at Ecclesfield St Mary's.